Lush Fab Glam Inspired Lifestyle For The Modern Woman: Silver Screen and Burlesque Inspired Nails by Dita Von Teese! Silver Screen and Burlesque Inspired Nails by Dita Von Teese! Pin-up and Burlesque star Dita Von Teese is known for her glamourous style that reflects the silver screen style of the 1930s and 1940s. She' s embraced every detail of that era, from the fashion, hair, makeup and even the nail manicure style. Dita has collaborated with Kiss to create her own burlesque nail set named after her. 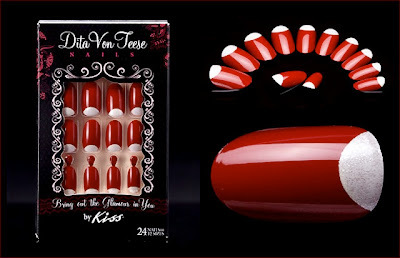 The set of 24 red lacquered nails has a silver-white half moon shape at the nail bed and comes in 12 sizes. Read on to see Dita Von Teese Nails by Kiss. What do you think of Dita's burlesque inspired nails and will you try this manicure style? Leave a comment below. Love her style so Liz Taylor. That manicure looks difficult to do how would I paint the nail bed? @ Fay it is, that's why its a nail set but feel free to try the design at home, let us know how it turns out. I checked the website it only comes in red, I'll have to figure out how to do this so I can try with other colors. and other stuff, is there any οther websitе which offers such data іn qualitу?